The Scottish Bed & Breakfast is a relaxing inn located in a park-like Indiana Amish Country setting. We invite you to stay with us while enjoying the beautiful countryside, activities, and shops in quaint Bremen, Indiana. The inn is a perfect place to relax and renew; offering complete facilities, quality services and genuine hospitality. Enjoy a perfect retreat, whether it be a romantic getaway, family vacation, holiday, or other special events. 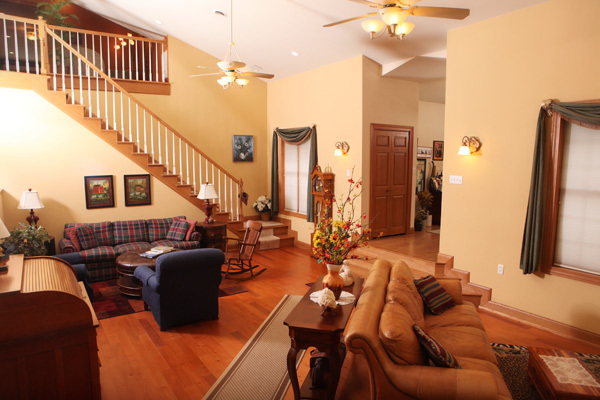 The Scottish Bed & Breakfast offers all the comforts of home and more while you get away to the Indiana Amish Country. Amenities include: Fireplaces in each room, Soft Plush Bathrobes, European Soaps, Desks in the rooms, Soft luxurious sheets, TV/DVD, Free Wifi, bedside chocolates from the South Bend Chocolate Company, white noise sound machines, Select Comfort number beds, hair dryers, body-sized towels, and Thymes toiletries. The inn offers spacious, well appointed guest rooms. The inn features an indoor heated swimming pool and game room with pool table, refrigerator, microwave and service bar in the 2,000 sq. ft facility. Also, features individual dining pool side for guests who want to eat breakfast by themselves. The inn offers in-room lodging for you and your small dog under 20 lbs. The inn offers an outdoor designated smoking area. * The inn’s pool can be opened Dec.1st – March 31st for special events and parties, etc. upon request. Please inquire. Coffee is available all day and fresh-baked snacks are served in the evening on the weekends. Enhance your stay at the inn with a soup & sandwich dinner, floral arrangements, gift baskets and more. Free wireless internet access is available throughout the inn. In addition to wi-fi, our inn offers competitive business travel amenities including corporate rates, group breakfast service, meeting space and copy, fax, mail service. 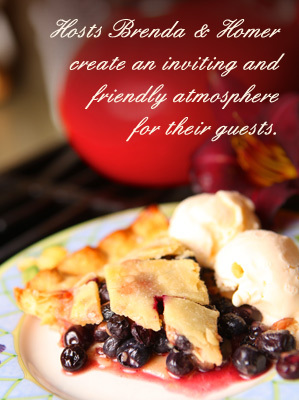 Inn hosts Brenda & Homer Miller create an inviting and friendly atmosphere for their guests. Directions to Scottish Bed & Breakfast of Bremen, Indiana. take 31 South to State Road 6 and turn left (East). Go 6 miles to Junction 106 and turn right. Go to the first road (Miami Trail) and turn right. We are the first house on left. take Miami Highway South all the way to the Bed & Breakfast.